Buntings01263 715779work01603 870304fax Self-cateringThis beautiful detached house enjoys modern utilities and a great garden with trampoline, barbeque and furniture. Only eight miles from the coasts, groups and families can enjoy all that the area has to offer, including a good selection of walks, cycle paths and other activities. Guests can easily relax and enjoy their memorable stay at this superb location. 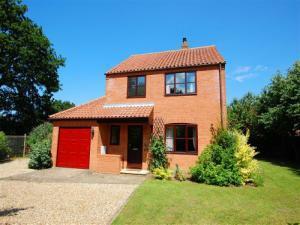 This beautiful detached house enjoys modern utilities and a great garden with trampoline, barbeque and furniture. Only eight miles from the coasts, groups and families can enjoy all that the area has to offer, including a good selection of walks, cycle paths and other activities. Guests can easily relax and enjoy their memorable stay at this superb location.